Situated at the edge of downtown Denver, Pepsi Center anchors Denver's thriving LoDo entertainment district and is the region's newest sports and entertainment venue. Besides sports and concerts, our arena floor can host banquets, trade-shows, galas, seminars and more! 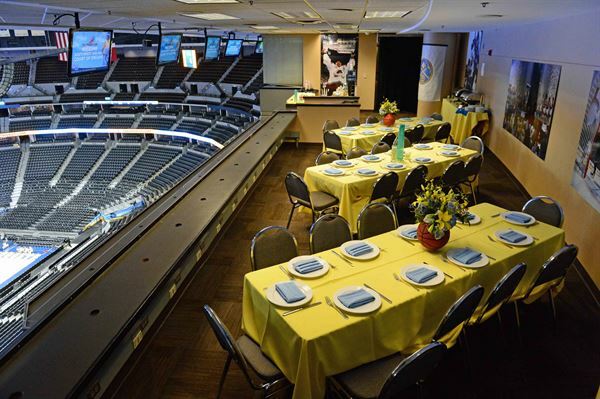 The Pepsi Center arena floor can be tailored to serve numerous events. And the newly installed center-hung video-board, among the largest indoor boards in the world in terms of viewing-area square footage, provides a major “wow-factor” for all presentations. The Pepsi Arena also features a variety of spaces from our executive board room and private suites to the Lexus Club and Peak Pub House. Ideal for trade shows, seminars and speaking arrangements. Club Lexus brings guests an incomparable, private, state-of-the-art luxury experience. The club offers signature food and beverage selections, exclusive parking, and dedicated concierge service to make Club Lexus a truly first-class destination to host and enjoy your private event. Club Lexus is sure to leave a lasting impression on your clients, employees, family and friends. The K Room, offers a sophisticated boardroom setting, complete with four large HDTVs and a full technology package, perfect for executive meetings away from the office. Floor-to-ceiling windows run the length of the space and provide beautiful views of the mountains. And the private balcony is perfect for guests to enjoy fresh air. Open-air space with a bird’s eye view of the entire arena. Perfect for intimate receptions and banquets.